Why grow these particular fruit? There are more than one hundred major species of fruits in the tropics, which make a very interesting contribution to the appetite as well as to good nutrition. These species vary in ecological requirements, in season of production, in yields, uses and, of course, in many other characteristics. The three fruits that are the subject here are outstanding fruits that are particularly important in feeding people. These fruits also produce a lot of food for a minimum of effort. In fact, they are practically staple fruits of the tropics. In contrast, mangoes are very important in the tropics, but are seldom a staple. Citrus fruits are varied, widely produced and enjoyed, but never a staple. These comments can be extended to many other fruits as well. Probably the most important fruit in the tropics in terms of distribution, use and contribution as food is the banana (for purposes of this discussion, bananas and plantains will be considered together). The many ways these fruits can be eaten makes them a popular everyday food. Its primary nutritional contribution is calories (as starch and sugar). The coconut is common and a daily food in some but not all parts of the tropics. It is well adapted and can be grown almost anywhere. The tree itself is versatile in its application and may be the most useful tree of the tropics. The fruit is used at all stages in unique ways, and is a significant source of protein and a major source of fat in the diet. The breadfruit, aptly named, a staff of life in the Pacific. Its nature as a staple is the reason that it has been so widely introduced throughout the tropics. Normally seasoned, primitive and modern methods of processing have been developed, and native cooks find diverse uses for the fruit. Its contribution to the diet is principally starch, and ripe fruits are rich in sugar as well. These three species can be grown on the same land over widespread areas of the tropics. Once yielding, they require very little care, and yield heavily for the efforts that are made to produce them. The food uses of these three fruits are summarized in Table 1. The nutritional contents of the edible portion is summarized in Table 2. Both Tables can be found at the end of this document. Bananas and plantain are typical of the hot, humid tropics and are adapted to heavy rainfalls, yet grow best in well drained soils. Rainfall is best if distributed throughout the year and, if not, supplemental irrigation is sometimes given. The plantain is better adapted to drought then the banana. Bananas are adaptable to a wide variety of soils but are least productive in sandy soils. Some of the best bananas in the world are grown in heavy soils. Bananas will tolerate some but not extreme acidity, and they are intolerant of salt in the soil. Bananas need lots of nitrogen and more than normal amounts of potassium. While bananas grow best in full sun, they tolerate shade very well and may have less leaf spotting in the shade. Bananas are sensitive to length of day, but can produce year round if other factors are suitable. A major enemy of the banana is wind. The root system of the banana is shallow, and when loosened by water, the plants are easily toppled by moderate winds. Weeds are another major enemy of bananas. Grass robs the nitrogen that bananas need so badly. Vines can cover the foliage reducing growth. Bananas should be cultivated under almost weed free conditions. Bananas and plantains are cultivated from suckers, shoots branching from the underground corm. For the most vigorous growth it is important to choose tall offshoots with thick stems and narrow leaves. The offshoots are removed with machete and shovel, and are often transported great distances before replanting. Banana fields are seldom plowed but holes are dug for the suckers. Manure or compost is added to the hole or mixed with the soil. Spacing is 2 1/2 - 3 1/2 meters, depending on size of the final plant. On hills bananas are planted along contours. The best time for planting is the beginning of the rainy season. The suckers are often treated for root borers and nematodes with pesticides, which should be locally approved and recommended. Fertilizer is applied in the planting hole, often only nitrogen. Needs for fertilizer vary locally. Weeds must be controlled and if cultivation is done, it should be shallow to avoid root damage. Fertilizer is applied twice yearly. Suckers should be controlled. The usual practice is to leave one half-size and one new sucker for every fruiting stem. The lifetime of the planting is often 10 or more years, but eventually replanting is desirable. A new plant produces in 9 - 18 months depending on condition and treatment received. It takes 2 - 4 months for a flowering shoot to mature a bunch of bananas. The stalk may require support so as not to fall early. Bunches are harvested 80 - 90 days after shoot appearance if they are to be shipped or as the uppermost fruit begin to ripen for home or local marketing. Harvesting large bunches may require two men. Harvested bunches must be handled with care to avoid bruising. Yields range from 10 -60 tons/ha. Panama disease (Fusarium wilt) occurs especially in very acid soils. It lives in the soil and is spread by planting infected suckers. Use resistant varieties. Bacterial wilt (moka) is another wilt, in which an oozing from the cut rhizome occurs, often on wet lands. It is controlled by planting clean material on clean soil. Nematodes, especially the burrowing nematode, destroy the roots and reduce growth. Clean, treated planting material is used for control. All bananas and plantains can be eaten uncooked when ripe. The ripe fruits can also be steamed, baked or mashed and fried. Ripe fruits are also crushed in some water and fermented to produce banana beer. Ripe fruits are made into candies or included in baked products. Green fruits of all cultivars are used as a starchy vegetable, boiled or roasted with or without peeling. When soft enough, they can be mashed or fried. Chips or slices of the unripe fruit can be dried and stored for later use. Banana flour is made by grinding the dried chips. Coconuts require a tropical climate and will be severely damaged by frost. A mean temperature of 25 degrees Celsius or higher is preferred. While most often found along coasts, and in sandy soils, coconuts can be grown in interior and upland regions, and in a wide variety of soils. Water, however, is an important requirement, and thus coconuts grow best where rainy seasons are long, or where roots reach the water table, or where supplemental water is given. Mature trees can withstand brackish water. Trees do not stand flooding except for a very short period. While there are many varieties of the often self-pollinated crop, it is useful here to talk about tall conventional varieties, ‘Malayan Dwarf’ varieties, and hybrids between the two. In general, the tall are slow to produce, have large and abundant fruits but are susceptible to the lethal yellows disease. The dwarf varieties are earlier and fruits are smaller, but trees are resistant to lethal yellows. The hybrids are the best of all, usually purchased in Jamaica, and should be planted for large plantation if there is a possibility of lethal yellows (remember, a palm may last 100 years or more). Coconuts are almost always grown from seed. Large, mature, fresh nuts, still in the husk, are buried on their sides up to 1/2 to 2/3 of their thickness in loose, organically rich soil and moistened frequently. This can be done in full or partial shade. When the first leaves break out through the “eye”, usually after 1-3 months, the coconut, still without internal roots, can be left to root and be transplanted later, can be temporarily established in a container, or can be planted on its permanent site. (Appropriate planting distance, 30 feet). If an effort is made to prepare the planting hole with a rich soil mixture, if partial shade is provided (with old fronds), and if some protection is given from salt spray (while the tree is small), the young tree can get off to a good start. Extra water is necessary. Fertilizer is often not given but as in the case of all trees, it is highly desirable. In the absence of data indicating other needs, use a fertilizer balanced in nitrogen, phosphorous and potassium at the approximate rate of 1/4 lb. per tree per year of each element, increasing gradually to 3/4 lb. per element per tree per year the 6th year and thereafter. The fertilizer will be more useful if mixed into the soil under the tree. Trash (old fronds, residues of nuts) should be removed from under the tree and weeds should be controlled. A living mulch of legumes, such as Indigofera, Crotalaria, or Vigna are often planted below the tree. (See EDN #26 pp. 5-6 for a discussion and seed offer of two non-toxic crotalarias, or sun hemp, that can be used for cut and carry forage). Some crops, especially cocoyams and upland taro and, if rainfall is sufficient, peanuts and soybeans may be grown. These can provide a cash crop while the tree is growing. The use of coconut groves as pasture is not recommended. 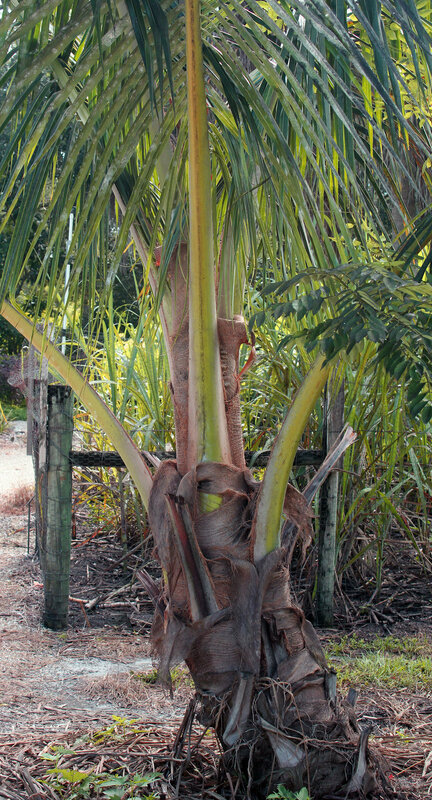 ‘Malayan Dwarfs’ and hybrids may begin to produce in 4 years, tall coconuts in six years, and production is continuous thereafter. Green fruits are obtained only by climbing and cutting them free. Mature fruits that fall naturally are gathered regularly and are best when used fresh. Fifty nuts per year is an average yield of a good, mature, well cared for tree. Coconuts have few pest and disease. Trees often reach old age without significant problems. Yet, occasionally, serious problems do occur. Lethal yellows -- kills the tree, use resistant varieties (above). Bud, not tip, dieback -- sometimes cured with copper fungicides. Yellow mottling (Cadana) -- very gradual yellowing, no reliable control. Trunk rot -- prevent spread by burning. Red ring -- caused by nematodes. Destroy infected palms. Rats -- ring the tree with sheet metal, prevent them from climbing from tree to tree, poison with warfarin. There are other localized diseases and pests. Coconut Water: The best coconut water is obtained from full sized but still immature nuts with soft endosperm. Coconut water contains about 6 percent sugar, and little else of nutritional importance. The nut should be opened carefully, by chopping the blossom end, in order to preserve the nut’s uncontaminated drink. The jelly-like endosperm is then eaten, often with a spoon. Coconut Pulp: Coconuts fall to the ground when ripe. At this time the water is slightly laxative. The pulp is firm and is eaten without processing, or may be shredded and dried to produce a long lasting product. The pulp may also be grated and then squeezed to produce coconut milk, a water-oil emulsion. Extraction is facilitated by soaking the grated coconut in water before squeezing through a cloth. Oil is obtained at the household level by boiling the grated pulp and skimming off the oil. The pulp can be dried to produce copra, which is then pressed to remove the oil. Sap: The sap is obtained from the inflorescence by an intricate process. The unopened spathe of the inflorescence is beaten softly, tied to keep it closed, and gradually bent downward. Later the tip of the spathe is cut and the sap will begin to flow. Each day a sliver is removed from the tip to keep the sap flowing, and this can continue for 4 weeks. The sap contains 10 to 15 percent sugar. It can be used as a beverage immediately or boiled down to make palm sugar. If not used, the liquid, sweet toddy, ferments rapidly to produce a wine and, if the wine is not used, will then ferment to vinegar. However, the alcoholic toddy is frequently distilled to produce a heavy spirit, arrack. The yeast that settles out of toddy can be used to raise bread. Cabbage and Starch: The bud of the palm, removal of which kills the tree, is tender and used for salad, either cooked or raw. The trunk makes poor sago (source of starch), but can be beaten, ground and soaked in water to extract starch. The breadfruit tree is at home in the hot, humid tropics. While common on islands and growing in beach soils, it is seen throughout the tropics, even in heavy soils, at mid elevations, and in monsoon climates, where it may loose its leaves during the dry season. All varieties can be divided into two classes. The seedy types are the normal and these are used for their seeds, which resemble chestnuts. The seedless varieties, preferred as a food, are all mutant forms. 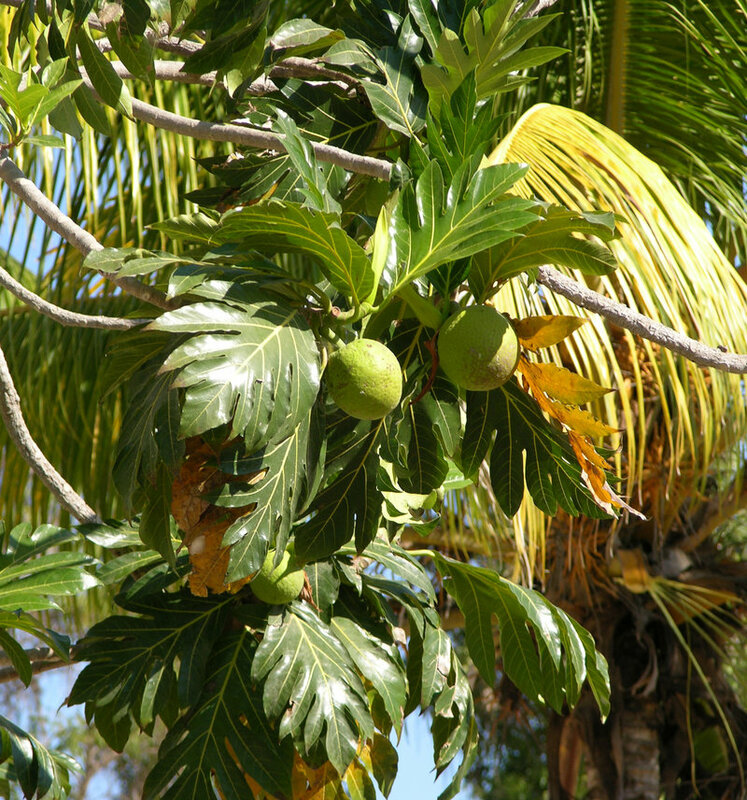 Breadfruit varieties are best known in the South Pacific, and complete descriptions are available in publications available from the Bishop Museum in Honolulu, Hawaii. In many places of the tropics varieties are not distinguished nor are their individual characteristics known. The cultivars differ only in small ways in their qualities as food. Seedy varieties of breadfruit are propagated directly from the seeds. They should be fresh and clean, and should be planted either in deep containers or in their permanent sites, in rich, loamy soil, moist but with good drainage. Temporary shade is desirable, and should be removed slowly. Young trees need no special care except perhaps extra water during dry seasons until they are established (2 meters high). Although manures or fertilizers are not normally added, such treatments will speed growth and increase yields. Seedless breadfruit are planted from shoots that emerge from the more superficial roots of an existing tree. Trees differ in their production of such shoots. When shoots occur they must be protected from animals and people, and are more likely to succeed if nurtured. Abrupt digging often results in a shoot coming from a large parental root, but with little or no roots of its own. Such shoots often do not survive transplanting. A better technique is to identify shoots early, dig around and below them and fill the area with a rich, loose soil mixture. Give the shoot extra water and a little fertilizer. When the shoot is 50 cm high, the parental root can be cut away a part at a time, in order to encourage the plant to strengthen its own roots. This can be done in three or four stages. The result will be strong new trees. Another technique is to dig up roots, taking cuttings 2 - 4 cm in diameter and 20 - 30 cm long and planting them 8 - 10 cm apart in beds moderately shaded and kept moist. A large number tend to die without sprouting. Propagation from stem cuttings has not been very successful. Young trees of the seedless breadfruit are treated the same as described for the seedy type. Generally there are few pests and diseases, but there have been some specific, localized disease problems. The fruits may rot (soft rot, Rhizopus) in a wet climate. Pruning the tree to admit more air movement reduces this problem. The fruits of seedy varieties fall when ripe and soft. They should be picked up promptly to avoid spoilage, and then removed from the pulp by hand. Sometimes this is done in a basin of water. The seeds are used immediately or are superficially dried to hold for a few days, as when marketing them. The most common technique is to boil the seeds for about an hour. Salt is usually added to the water. The seeds are then cooled and peeled by hand. They may be eaten directly or can be mashed and combined with other foods. They are starch-like in flavor, of dry texture, and agreeable in flavor. The fruits of seedless varieties will not fall until ripe, and in doing so smash themselves into a useless and dirty pulp. The fruits are normally harvested as needed for eating or for selling fresh. Their useful life is short, perhaps a week. Fruits can be harvested at any stage. In fact, the male and female flower buds are often taken as a cooked vegetable. However, it is the mature but still green fruits that are the best food, rich in starch but very low in protein, fat, minerals and vitamins. The entire breadfruit is often baked in the South Pacific, but this is a long, slow process. A practical technique is to cut the fruit into pieces, about the same size as those of boiled potatoes. They are often peeled but it is not necessary to do so. The hard and more fibrous core is usually discarded. The pieces are baked until soft and then are used just as a potato. Alternatively the partially cooked piece may be cut in strips or slices, and fried. The cooked and mashed breadfruit can be used in baked goods in partial substitution for flour. Whole sections of fruit are stored in sealed pits in the South Pacific, where they ferment and can be eaten during the off-season. Large, over-mature fruits can be harvested and will ripen in a few days. The entire fruit is often roasted and makes a sweet dessert, something like a pudding, though not everyone likes the unique taste.